Are New Zealand politicians naive? Babes in the wood? Country yokels who don’t understand realpolitik? Every year, New Zealand climate ministers make speeches about closing down Huntly at climate conferences all over the world. This allows them to be seen as ‘good guys’ and join the ranks of counterpart ministers from dozens of other countries — all of whom are making speeches about closing coal plants. These speeches are a good thing. They give the ministers a rosy glow about their own selflessness and encourage everybody else to try harder for the noble cause. Everybody (except New Zealand) knows that this is political theatre. It gets great headlines and makes the voters back home feel proud. It also encourages the troops — the thousands of full-time green activists who attend these gatherings as their annual perk. They need to re-stoke the inner fire if they are to go home and hit the streets with their collecting boxes. Of particular interest are the categories “under construction” and “planned”. In the EU, whose ministers always make the longest and loudest speeches, there are 5,810 MW (12 Huntlys) being constructed right now and a further 9,270 MW (19 Huntlys) planned. In non-EU Europe, 49,873 MW (over 100 Huntlys) are currently planned. The all-regions totals make nonsense of the very idea of “global decarbonisation”. Even if you accept that human emissions of carbon dioxide will cause climatic calamities, these figures show that other nations’ emissions are overwhelming ours — so our scant sacrifices will never assist the climate. It is particularly interesting to compare these figures with those of the English-speaking world (UK, USA, Canada, Australia, New Zealand, Ireland). None under construction and none being planned. Is there something they put in the language in the Anglo-sphere? Or are they being out-foxed by cynical sophisticates from older language groups who better understand that words don’t always mean what they say? New Zealand (with Australia) is the biggest fall guy of all. Although richly endowed with coal, our local usage is dwindling and exports have almost dried up. Successive climate ministers have set deadlines on the use of Huntly and constantly whittled away its stockpile of coal. Over the past decade Genesis has provided the greatest reduction in emissions from within the electricity sector. Genesis’ share of electricity-related emissions has dropped from 59 per cent in 2008 to 44 per cent in 2017. We have reduced the coal stockpile by around 80 per cent within the last decade and have retired half of Huntly’s 1,000 megawatt coal-fired capacity. They make that sound like a good thing, but the reality is that, in a dry year, Huntly can no longer keep the lights on without emergency imports of coal. 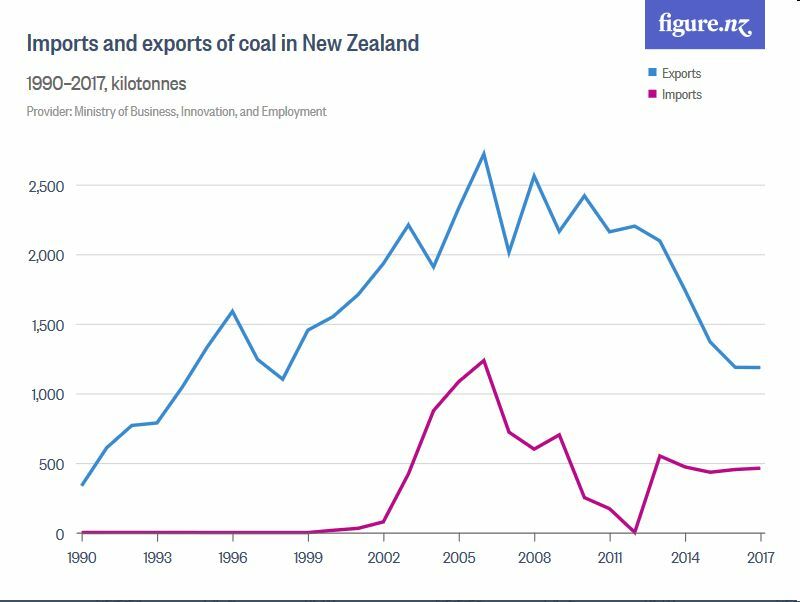 Whatever quantity is required in a dry year, we certainly shouldn’t import coal when New Zealand sits on enough to keep us going for about 7000 years 1. What’s wrong with letting a dry season’s worth of coal just sit there for the good of the nation? We know that burning coal in a modern, clean, soot-free, pollution-free furnace with flue scrubbers produces the cleanest emissions in history, but the MfE says they must now be called “dirty” just because they think carbon dioxide causes global warming. But calling it dirty doesn’t make it dirty. The MBIE lists 18 producing coal mines at the end of 2017, which together produce something over 2,800,000 tonnes of coal. We produce somewhat more than this, as there are four more “private” coal mines whose production is “confidential”. Our main use of coal, not surprisingly, is to provide heat for various purposes. Our coal exports have been declining, about halved in 12 years, so we export about 1,200,000 tonnes, close to half our production (43%). It’s hard to be certain, but it seems the industry itself is shutting down the coal-fired generators, apparently preferring the lower CO2 emissions of gas. The government encourages this, but perhaps it’s more of a plain financial response to the ETS—in which case it reveals the deep stupidity of the ETS. We need the lights on all of the time. We will not save the planet in the dark or stricken with poverty. This opposition to coal (“keep it in the hole”) is driven by the Greens’ hatred of industry, not by an aversion to CO2 emissions. If they were serious about CO2, they’d be campaigning for nuclear power, because that’s the only practicable source of electricity that’s both affordable and carbon dioxide-free. Every other option either causes more emissions, is more expensive or is simply too unreliable for the needs of a modern economy. Even Germany, until recently the darling of Greens everywhere, is planning more coal-fired power stations to maintain security of supply and Canada plans to shut down its remaining 15 plants by taxing them to death — all this to “save the planet”. Watch what happens when coal usage either declines to practically nothing or the hate campaign fails to put a dent in it: the Greens will attack some other aspect of industry, because their campaign has nothing to do with global warming—after all, with no significant warming for at least two decades, there’s nothing to stop, is there? A little warming, but hardly dangerous. Current temperatures are little changed since the 1980s. The various excursions have returned to their starting points so we have to ask what the Greens are complaining about. According to Wikipedia, the following planned thermal stations have been granted consent. Orion New Zealand, Christchurch, two diesel-powered plants totalling 23 MW. Nova Energy, Taranaki, a gas-powered plant of 100 MW. Contact Energy, Otahuhu, a gas-powered plant of 400 MW. Genesis Energy, Helensville, a gas-powered plant of 480 MW. There are no new coal stations on the way, but diesel and gas are great fuels, and far more reliable than windmills. These total 1003 MW—a handsome addition to our fleet—though financial viability could be a problem, since this new capacity constitutes a lot more than the remaining 500 MW Huntly coal units waiting to be shut down. New Zealand actually has a second major coal station of 112 MW, but it’s fully integrated with the Glenbrook steel mill and unavailable to the general network. It burns coal or gas, making good use of surplus natural gas from the iron-making kilns. For the last 70 years and more we’ve made excellent use of the fine resources nature gave us, but this coalition government has had its brain royally ruined by greenwashing and there are grave fears that unless our leaders open their eyes to the facts, this shangri-la in the South Pacific could be in for a horrid awakening. Dividing our proven reserves of coal (from GNS Science) by our total coal consumption in 2017. Why are we planning gas fired power stations when the government have stopped all further gas exploration? Coal-fired is by far the most expensive source of electricity in NZ. Huntly doesn’t operate most of the time purely for economic reasons. We do however need some form of thermal back-up when lake levels are low. NZ is incredibly fortunate in having huge untapped geothermal resources. There are a number of planned geothermal power stations which are on hold because the electricity demand is not there. If you want any credibility, you have to stop denying that the climate is warming. 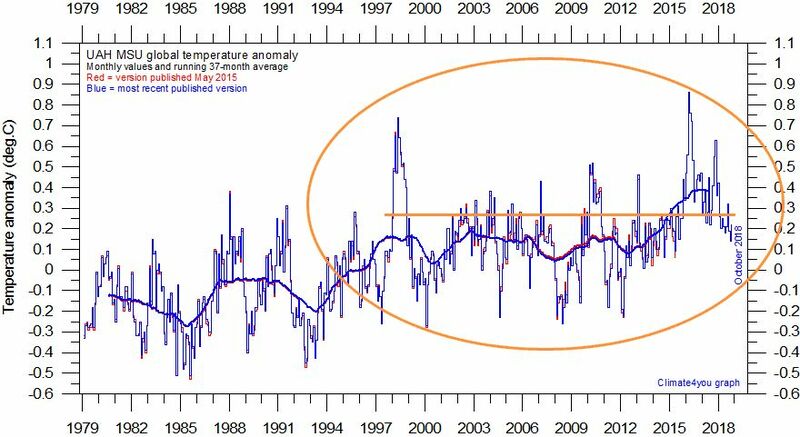 Drawing a flat line on a temperature time series which show clear evidence of a warming trend just makes you look stupid. Your claim that there has been no significant warming for at least two decades is false. Significant has a precise meaning. Do the math, look at the p-value, and then test for significance. Gas reserves, defined as quantities that are commercially recoverable, stood at 1,985 Petajoules at 1 January 2018. It represents around 10.5 years of demand at 2017 demand levels. The Government’s announcement in April to halt the granting of any new offshore oil and gas exploration permits prompted a high level of interest in the status of the reserves. Of course, as we might expect. Neanderthals. Still, there are existing exploration permits to be exploited, plus perhaps new land-based permits. And surely the coalition will be extinguished at the next election and Winston Peters punished for the treason of raising the Greens over the Nats. Read what I said: “A little warming, but hardly dangerous.” You’re yelling “fire” in a crowded theatre, you muppet. How much warming do you claim there’s been over the last 20 years? Coal-fired is by far the most expensive source of electricity in NZ. No it isn’t. Prove it. The recent South Island rain has saved the day this time. Spot prices for electricity a few days ago were through the roof. At some stage we will be caught out. If we have a surplus of power generation at present as Simon suggests why is Top Energy extending the Nawha geothermal plant with such alacrity. It’s not a little warming, it is about 0.175°C/decade since 1980, which is extremely dangerous. There have been several reports produced from multiple governments and organisations that discuss the implications. Genesis will never tell you what their cost structure is but the coal-fired unit never kicks in unless prices are high. Pre-Genesis days it was around 18.5c/kWh. The gas-fired units would be cheaper than that. Exactly my point. We need thermal backup for hydro and wind, and geothermal makes much more sense than coal-fired. I don’t think the Government should have banned natural gas exploration as there is no harm in having that option as a backup. Importing coal from Indonesia is the worst possible outcome. Gas is good for peak load as you can ramp it up very quickly. Simon, you can’t use geothermal for dry-year back-up. It’s a 24/7 baseload source and will already be running flat out when Lake Hawea’s levels drop into the danger zone. In any case, there’s virtually no hydro prospects left and not much geothermal. What are you proposing for the huge extra demand the Government is planning for its EV fleet? BTW, you attempted to answer an assertion that there has been no statistically significant warming in the past 20 years with a reference to warming in the past 37 years. Why? To include the only sustained warming period since World War 2? It’s widely agreed that there was no significant warming for the 18 years between 1997 and 2015. Then the 2015-16 super El Nino (weather, not climate) broke the pattern with the fastest warming year on record. However, since the peak in February 2016, we have seen the fastest cooling period on record. Within a few months, its very likely the latest 22-year period will show no significant warming. How do you calculate that increase since 1980 and what dataset are you using? It’s perfectly stupid to classify a possible 1.75 °C/100 yrs as “extremely dangerous”, when forecasts under RCP 8.5 were 6 °C and up, and the IPCC have been urging us to keep it (as if we could) under 2 °C by 2100, which would be satisfied by your figure. I looked at five of the global temperature datasets on Climate4You to get an idea of the trend from 1975 to October this year, just looking at the change over that period. You don’t explain why you chose to start in 1980, but I said 20 years and took it back a year or three to avoid the El Nino. I couldn’t understand the RSS data so didn’t use it. The 100-year trends in four of the datasets are as follows. None are “extremely dangerous” and all under the magic 2 °C. You must know that the cost of coal generation is not the price of coal-fired electricity after it has been driven up by the high cost of wind power. They only turn on the coal generators to profit from the windmills. But that’s the dreadful result of our electricity pricing system, clearly designed by the very bandits who benefit. 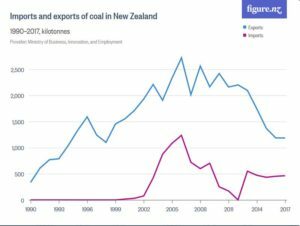 Claiming that coal is “by far the most expensive source of electricity in NZ” is not true. Typically, warmista use the upward curve of a sinewave for their heatogeddon claims. What went up is now coming down. Dishonesty has its own special reward. Ah. I knew this theoretically, in relation to backing up turbine farms, but hearing it come back to me from a warmster alleging coal is expensive took me by surprise. Turning the argument around makes it sound like something else. Thanks for the clarification. Agree with the rest of what you say. What do you mean by “more reforms soon”? Oh, I see. I like the idea of getting rid of farms. I live near them. Sometimes they smell awful. Supermarkets have nice music playing. You need at least 30 years to determine a temperature trend. All of the surface temperature time series will give the same result. The 2 °C limit recommendation is from pre-industrial. We are half-way there already. The marginal cost of renewables electricity production is almost zero. You need to purchase the fuel for thermal generation. If coal really was cheaper, the Huntly unit would be operating continuously. Max Bradford’s reforms originally had a separation of generator and supplier to prevent the cross-subsidisation behaviour that the big players were engaging in recently. Simon – this is an opportunity for you to explain why you choose to measure temperature increases from “pre-industrial” – rather than from the 1960s, when the IPCC says human-caused emissions began having a detectable impact. The term gives you latitude to cherry-pick any start-point before 1712 (invention of steam engine). But the IPCC doesn’t do that. It picks the end of the Little Ice Age (1850-90), which certainly was NOT pre-industrial. This start-point just happens to be the lowest recorded temperature in recent centuries. Now that is deceitful. The IPCC also says CO2 atmospheric concentration was 280ppm in “pre-industrial times”. This rough figure doesn’t derive from the late 19th century, but from much earlier proxy sources. Keeling’s accurate figures began from 313ppm in 1958. So there is a disconnect between the timing of the base temperature and the base CO2. On a second point – you don’t need 30 years to determine a temperature trend. THE UNFCCC treaty was agreed at the Rio Earth Summit in 1992 despite the fact that the warming trend was only 12 years old! Thirdly, 0.87°C of warming since pre-industrial is cited in last month’s SR-15. That’s not “half-way there” to 2°C. Good idea Richard. Let the farms go wild, as the Supermarket carparks will be for a short while. if wind energy is so cheap, why does South Australia, which has lots of wind energy, have some of the most expensive electricity prices in the world? The Little Ice Age was not an ice age but rather three cold periods around 1650, 1770, and 1850 primarily driven by volcanic activity. 1850 is also the first year in which we have reliable global thermometer coverage. The actual definition of ‘pre-industrial’ used by the IPCC is the average temperature between 1850-1900 to negate the impact of the cold period around 1850. The climate is warming Barry, it is pointless trying to deny it. Incredible. Once again you give us mere computer models. Thermometers are not computers. Statistics don’t require computers either, they just make the calculation easier. Sure. Hey, I’ve found this black box! You put the problem in at one end and the answer comes out the other end. It’s fantastic! Animation of the main steps needed to estimate the Global Warming Index. The first and second step shows observations and natural and anthropogenic foring (sic) estimates (W/m2), including 200 different realisations that comprise the full forcing uncertainty. The third step is the application of the response model which converts forcing in a fast and slow temperature equivalent as a function of the best estimate for TCR, ECS and the response times. In the fourth and fifth step (sic), the sum of the two responses before regression with the observed temperature is shown together with the resulting combined temperature response (red). The sixth step is the same response after multiplying it with the slope provided by the the (sic) least-square-fit between temperature and natural/anthropogenic response (sic). Finally, the full uncertainty range for the natural and the human-induced contributions is estimated and added to the graph. This is without mentioning the shattering revelation that they have discovered precisely the natural and man-made forcings and therefore the temperature trends they each induce. Though they haven’t yet advised the IPCC, who still don’t know the difference. It sounds as though you believe them, too. The GWI is a measure of observed warming. Attribution is solely an apportionment of the observed warming to natural and anthropogenic forcing components. You can dismiss that if you want, but it doesn’t change the fact that as at October 2018, the observed temperature is +1.06°C higher than the mean temperature between 1850-1900. Simon – I agree entirely that it is pointless to deny the globe has warmed in the last 117+ years. The arguments are, and always have been, around how much and why? And why the IPCC chooses to cherry-pick 117 years, rather than a more recent and relevant period. We can all agree that human activities made no detectable difference to the global temperature during the 1850-1950 era. So why use that period? You say a thermometer had been invented but they were pretty primitive, with no screens, and confined to <5% of the earth’s surface. Fitzroy didn’t even invent the first local weather report until 1861. It is also pointless to deny the globe has failed to warm during the 21st century. A period which has seen more greenhouse gas emissions than any other. The GWI you reference pretends to know the exact contribution to global temperature change made by internal natural variation? How? The IPCC makes no such pretence. That is one of its major weaknesses. What a load of tosh. Observed warming for the 21st Century is 0.21°C/ decade and it is statistically significant. The temperature was 2-3C hotter than it is now during what was called the medieval warm period lasting from 900-1300AD. The vikings under Erick the Red settled Hvalsey in Greenland in 985AD, grew crops and farmed animals the settlement grew to 5000 people by 1300. You can see the remains of the settlements today. Can you explain to me where the man made CO2 came from to cause this warming? The most expensive generation quoted into the grid is the 156MW running on diesel at Whirinaki. There are also dearer diesel engines on the distribution grid at various points -sited strategically to protect those networks. You do not understand the difference between SRMC and LRMC. If Huntly was baseload, it would be a lot cheaper. However because it has to cover all its fixed costs in a shorter running time, the price has to go up to be economic. Wind (and solar) are useless because they are unreliable, non- dispatchable and cannot provide the critical features like inertia. The latter was what killed SA and why they now shut wind down there to keep gas turbines running.